Stingless bee 3, f, side, peru_2014-07-30-13.17.15 ZS PMax | Flickr - Photo Sharing! Honey is not the singular creation of Honey Bees, but other, even older lines of bees have been creating honey to get through hard times for tens of millions of years. 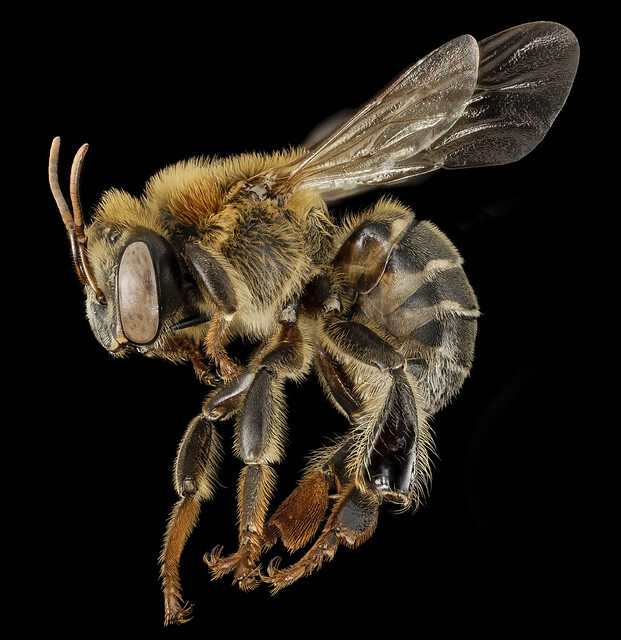 One such group (Melipona) is resident in Central and South America where they inhabit woodlands and jungles and are the mostly commonly sought after local wild bee for their honey. Larger than most other stingless bees (which can be as minute as half a grain of rice) some species are actually larger than Honey Bees and thus they store larger quantities of honey than their smaller stingless relatives. Indigenous peoples throughout the range of Melipona have both hunted wild colonies for their wax and honey (stored in small pots that look like bunches of grapes rather than in honeycombs) and have brought colonies back to villages after sectioning off the hollow logs where the nests occur. The taste and color of stingless bee varies with species and what the bees have been foraging on, but is generally sweet in taste. Unlike Honey Bee honey its higher moisture content causes it to degrade slowly over time, similar to olive oil. Also just like olive oil, there are long lists of purported health benefits accrued to those who regularly eat this tropical honey, and, interestingly, there is evidence that while some benefits are simply imagined others are real, suggesting the need for future pharmacological research. The La Legítima is so named by villagers of Comunidad de Chino located in the flood-prone lowlands of Amazonian Colombia. German Perilla at George Mason University is working with the isolated village to create a commercial product from their honey along with other locally collected and created materials as part of a new collective model for non-exploitative commerce in small remote communities. Doctorlo, BautistaNY, Fifi-2012, and 15 other people added this photo to their favorites.